Join us for the kick-off of the 7th annual Imagination Celebration: a full day of fun celebrating self-expression, creativity, and community. 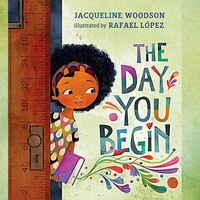 Our inspiration this year is The Day You Begin by Jacqueline Woodson, a book about how sharing our unique stories helps us to find understanding and common ground. Enjoy crafts, movement, and games with our community partners, early learning activities for children ages birth to five, free face painting, and souvenir photos to take home. Want more? Come to one of the many Imagination Celebration programs at our library branches throughout April.